Yes, but it is traced from the figure and then repositioned instead of drawing it properly. And then mirrored, too. The Saichania gets straight up copied and pasted as well. Anyone got an idea what the Velociraptor is inspired by? Because I don't think that is original either. The Jurassic Park franchise, just like all six of their previous "Velociraptor" figures. That's how one can make a Velociraptor figure that's new for 2017/2018 that's mostly featherless and has an absurdly wrong head shape. Also, the image below was posted earlier in this thread. It has a Schleich sculptor working on a T. rex figure. 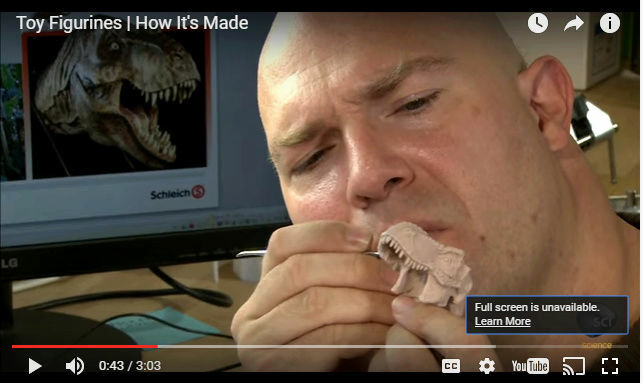 On the screen behind him, the image with the Schleich logo beneath it is of a T. rex from Jurassic Park, which is easy to find in a Google Images search for "jurassic park t. rex". Those would be awesome. Their Dunky was quite spectacular. 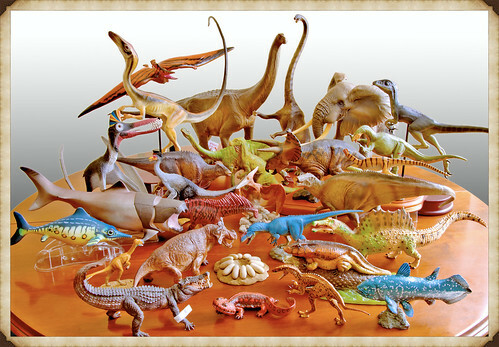 Do we know who the artist who does the sculpting for Schleich is? Yes, I pointed that part of the video out in several threads about it. No need to tell me. I meant a specific artwork for the Raptor. You know, one of those poor attempts to give a JP Raptor feathers. I wasn't aware of that, I don't remember seeing it until Takama posted it. I guess I didn't see what you said in other threads about it. That part of my post about the video with the JP T. rex wasn't being said specifically to you though, it was for anyone reading it. I realise now that might not be clear as it was just below my reply to your question. Just got the Kentrosaurus, and honestly, they should have released the stegosaurus last year and make another new dinosaur. It would have been better that way. So what exactly is the difference between the new Kentro & the one from a year or so ago?? Some folks say it's better, I've heard it's not as good. The pics look pretty similar. So can anyone tell me what improvements have been made? I thought the 2017 Kentrosaurus was better than the 2015 version, but the other day I've seen them both in hand in a toy store and I changed my mind. Still don't think the 2015 one is particularly good, but the 2017 version seems worse in terms of sculpt, plus the one that was there was painted so badly to make the older version look vastly superior. I don't mind the Kentrosaurus figure, but I think the newest one is better and I'm sure everyone was disappointed on the Acro. I believe that the Schleich kentrosaurus 2017 is not worse than the 2015 one. What happens is that it has a more static pose and a less colorful and bright painting. As for the acrocanthosaurus, it is not really a good figure, quite the contrary. 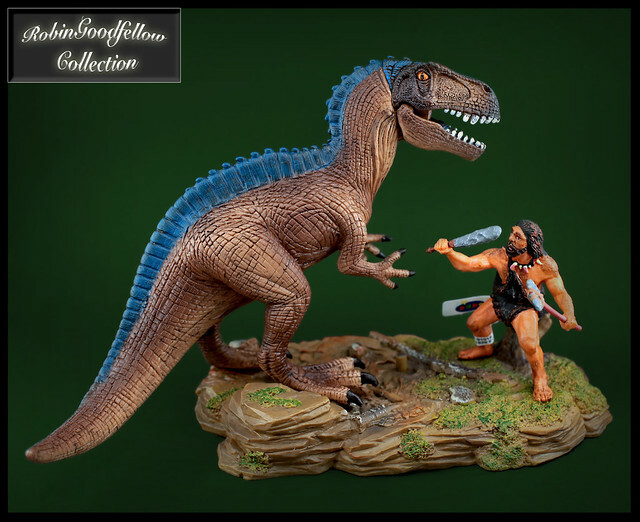 Hopefully, from now on the Schleich brand will not make figures like the acrocanthosaurus or rather reedite a more attractive figure. Schleich has the potential to spare it. ..I'm sure everyone was disappointed on the Acro. ..well, if you like vintage monsters, it's perfect for retro-looking dino-scenes as Gwangi..
" Never judging a three-dimensional figure by a picture: see it first with your own eyes ! " Yes, a place for everything and for everything a place. As the Romans said,"De gustibus non est disputandum" - beauty is in the eye of the beholder, or there's no accounting for taste. I see. So have I got it right in thinking the Stegosaurus was only available in a volcano playset originally, then it was released separately only in the USA in 2016, and then it was released separately in other parts of the world in 2017? That would be quite a weird and confusing way to release a figure. So you're saying the three theropod figures have only been released in a certain place, and will be available elsewhere in 2018? So what are the differences between the new T. rex and Carnotaurus and the previous ones? From the pics it looks like the rex doesn't have the pronated hands like the earlier ones but I can't tell much else. And the new Velociraptor looks as sucky as the old one, sorry to say!